It's The Hochstadt.com Party Contest! My blog’s Alexa Rank now dropped from 51,059 down to 174,666! I invited a select few Top Entrecarders and Internet Entrepreneurs to join our one-of-a-kind Hochstadt.com Party Contest and celebrate together that it is indeed possible to catapult from no man’s land to popularity in 107 days! Without further ado, let’s get to the “Party Contest Meat”—or in other words, what YOU can WIN at this Hochstadt.com Party Contest! Men’s Interest, Women’s Interest, Sports, Internet Marketing, Make Money Online, Technology, Hobbies, Marketing, Self Improvement, Computers and Internet, Art, Environment, Finance and Investing, Web Development, News and Media, Entertainment, Graphic Design, Religion and Spirituality, Blogging Resources, Parenting and Family, Technology, Mixed Bag, Home and Garden, Health and Medicine, Trends, Personal Diary, and Writing and Literature! Max from SiteHoppin gives 10 Beer Stock Pages worth $20-$100 each = $200-$1,000 PLUS 50 One Buck Wiki pages worth $20 each = $1,000, altogether making it to a whopping $2,000! Martin Russell from Word of Mouth Marketing gives 50 (!) accounts of 10 cards each at SendOutCards.com worth $25 each = $1,250! Gary Evans from Law of Attraction Secrets gives 10 (!) of his Manifest A Miracle systems worth $97 each = $970! Marcus Hochstadt from Internet Business Guide For First Class Progress gives respectively 1 of each of his 4 DVD products worth $100 each = $400 PLUS one 2-hour Multimedia Coaching Session worth $300, altogether making it to a $700! Debbie Lane from Wisdom Hypnosis gives 7 of her Living The Lucky Life! audio CDs worth $23.77 each = $166.39 PLUS a personal 1.5 hour Hypnosis Session by phone worth $250, making it a total of $416.39! Pat King from FitnessLifeClub gives 1 month of his Premier Health Coaching Package worth $357.98! Keith Goodrum from On Becoming a 2%er gives 2 of his DVDs 10 Minute Blog Post worth $100 each = $200! Andreas from XavierMedia.com gives 5 one-year VIP memberships to CreateBanner.com worth $35 each = $175! Larry Brauner from Online Social Networking gives a personal 1 hour consultation worth $150! Jason from The University Kid gives two 60 minute Blogging Consultations worth $60 each = $120! Leisa Watkins from Dream Act Plan Believe gives 3 Robert G. Allan books that are personally signed by Robert (! ), as well as 3 Richard Paul Evans books, also personally signed by Richard himself! Karl Gechlik from Ask The Admin gives a professional technical e-mail support session worth $50! Wayne from Ez DIY Electricity gives $50 in hard earned PayPal cash! Borzack from Making Myself Extra Money gives 5 of his Page Peel Ads scripts worth $8 each = $40! Stephan Miller from Stephan Miller gives one copy of Confessions of a Lazy Super-Affiliate worth $29.95 PLUS a Special Report he wrote specifically for the person who wins this e-book! Crystal from Ubiquitous gives a Site Review worth $20 PLUS a link on her Blogroll for one month worth $10, making it a total of $30! Sam Freedom from Internet Marketing Controversy Blog gives a 2-month membership to a large Private Label Rights (“PLR”) membership site worth $30! Kelly Naylor from Aerten Art gives one of her unique art work Acid Rain, an original water color painting worth $25! Dwayne from Pro Blog Reviews gives a Blog Review worth $25! Frank from Technology Blog and more gives a StumbleUpon advertisement campaign worth $20 (400 targeted visitors)! Kacie from Sense to Save gives a StumbleUpon advertisement campaign worth $10 (200 targeted visitors)! The Fool from Foolsville 2.0 gives $10 in hard earned PayPal cash! Lightening from Lightening’s Blogworld gives 2 Blog Reviews worth $5 each = $10! Constantin Codreanu from INconstantIN gives a one year .com domain registration worth $10! Iris from thebuzz gives a link on her Blogroll for one month worth $10! Layne from Reward Rebel gives 1 copy of Reward Rebel LOOT worth $7! Fitz Villafuerte from Ready To Be Rich gives 2 stumbles & diggs per week for one month! Theda K. Rogers from Crayon Writer gives a full-blown site review on her blog which will certainly increase the buzz for her winner’s blog! Mert Erkal from Search For Blogging gives an Invitation to the May issue of www.bloghology.org, which has more than 3,000+ subscribers! These are contributions for 200+ winners (!) with a monetary value of more than $7,000+ (!!) and exactly 66,666ec (“ec” = Entrecard Credits)!!! This is by far the BIGGEST Party Contest in Entrecard’s History! NOTE: I changed the point structure slightly because it turned out to be a bit unfairly weighted. Hopefully it is fair now so more people can win something. And I now give 2 points when using the party contest image below. Draw of the winners will be held on MAY 1st! 174 Responses to It’s The Hochstadt.com Party Contest! Great party. Just posted about it and linked to all the contributors, so count me in. What an amazing networking achievement. Congrats Marcus! Wow, that is a lot of prizes! You’ve been very busy. I’ve already done the write-up and will keep promoting it. Great job! I’m giving away some bonus prizes in conjunction to encourage people even further to enter and link to all. Like they really needed more incentive :). But they’ve got to let me know they used the link to all option by commenting on my blog. Hope that’s OK. If not, well then, just edit this comment. Yeehah! The Party is on and nothing can stop it! This is really great, crazy as can be. I will be posting about this so that other bloggers can join in and maybe get lucky and win the big prices. WOW! What an amazing list! Tomorrow’s post on my site (18 Apr) will be about your party. Woo hoo! Done did it all, digg here. I have my party hat, balloons, streamers and lots of confetti. Even though Alexa may have temporarily disappointed you, your enthusiasm hasn’t let anyone down and that’s the true spirit of living. We came to party and we shall party! Btw, if you send me your Technorati link, I will fave you. When it’s time to party, party hard! Bring on the cash prizes, entre credits, and the booze. Oh wait is booze a prize? 1 May 2008 is the dead line? Today is 18 April 2008, 12 more days to go! Very cool Marcus the man and in my eyes you’re ranked 42,978! It’s the all new FrankJ aka blogzilla Ranking system. I can not wait to win the prizes! Either Blog review or hoppin prize will be ok.
Hey fantastic contest! Do we get extra entries for putting your banners up on our site? I think you should!! Oh ya, I subscribed and saved you as a fave on technorati! Sign Me Up! I’d love one of these hot prizes. im in for the party!! Great job putting together the contest, it looks great; and thanks for inviting me to sponsor! Plus given you a stumble. I can’t quite figure out how to subscribe to your email list – don’t know what’s wrong with me but I can’t click on that box???? i only can post a comment and submit your RSS feed. i don’t have stumble, technorati, digg and more. Wow! This is one of the biggest party that I have ever encountered! So here is a comment for you! All the best!!! Yeahhh!! That’s what I call a party!!! I’m getting the beer from Site Hoppin! :D Max??? I think that ads up to 34 points! Yea! I really hope I win something! Great party, Marcus! Hope everyone enjoys it!!! Don’t ever stop this Great contest. Must be chance from better to be better again. Don’t ever stop this Great contest. Must be chance from better to be more better again. Great contest! 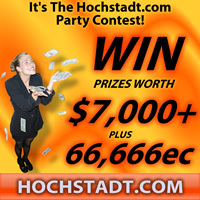 I subscribed and wrote about the contest with the full list of sponsors and prizes at http://entrecarder.blogspot.com/2008/04/hochstadtcom-party-contest.html. very impressive achievement…continued success..I’m in! I poted you here for others to party with us! I’m in Marcus. Thank you for organizing this. It’s going to be huge!! I’ve just published a post to my blog promoting “The Party” and listing all the contributors links and the prizes being offered. Good luck to everyone. Well, put me down for 11 points my friend, one for this comment and ten for the posting link that will shortly follow. Great party – I brought the blender. Wait, who is that taking their clothes off over there …. A terrific party contest so far! Let’s Party! More ideas are welcome! wowsa! sounds awesome count me in! I agree with Martin, this is quite a networking achievement, WTG Marcus! (hey, you left out points for tweeting about it ;) ). I don’t want to sound selfish or anything but I want it all! How about an extra poit for peeps that sign up for contributor feeds? What a smart contest. I hope that it brings you a lot of traffic and goodwill. I think you should be nominated for having the “contest of the year” or some award. I’m a sucker for contests, so of course I had to drop by and leave a comment here! I really like that you have prizes available that are not just blogger related! Stumbled, dugg, added to technorati and put the picture on my site… I usually don’t do contests, but this is one seriously huge contest, so I’ll make an exception! Awesome contest. I wrote about it and linked to everything over at my blog as well as adding the 125×125 ad. Thank you! Great, I added your 125×125 ad on my blog. Will probably make a post about it in the future. Btw an article about your contest is available on my blog. I’ve subscribed to your newsletter and blogged about your blog and contest with links to all your prizes and sponsors. I’m lucky my Alexa’s raking improve … but Your Contest is really fantastic. Join u lol!!! Whoa – that is a HELLUVA party! Just subscribed and faved ya – and if you’d like another sponsor (for this or another party), holler at me. Would love to contribute. Okay, I’ve subscribed, I’ve stumbled (and left a review), faved you via Technorati, and I’ll see whatever else I can do. BTW, I really want the Porsche — can that be arranged?! Huge ranking party…I am blogging about it! You never know if you never try right? I’v subscribed, blogged, commented, linked to the image, linked to the Hochstadt blog and party page, linked to sponsors…so that’s maybe 45 points if I ain’t wrong! Congratulations on your party (whoopee!) contest! You have some big prizes from the big time bloggers right here! Subscribed to your awesome site! Hope I could win some of these prizes! Good luck to all of those who joined! Have a great week! Awesome party Marcus! Thanks for letting me be a part of it. Great idea — good luck with Alexa! including all links, 60 points. Faved you on Technocrati 1 point. Money is nice for me, second best would be free advertising. Let’s enjoy the party! I would like to win your DVDs Marcus. Don’t exaggerate Alexa ranking, it will improve sooner or later. You already won the game by organizing a blogging contest worth $7000. You rock my friend! Great party my man! Great work putting together so many premium prizes! I’ve stumbled, dugg, techno faved, used the banner image and posted with all the sponsors. It’s a great list of sponsors you have here and I’m only happy to help promote ’em all! oh yeah, I also subscribed to your newsletter! Also, I’d be willing to donate a 125×125 ad spot for a month (worth $15) if you’d like – I’d love to get in on the action! Commented! Stumbled! Dugg! Added to Technorati! dah, forgot the URL of my post! Cool contest. Just go ahead and send me all the big money prizes. j/k :) I stumbled, dugg, and wrote about the contest including listing the prizes. Simply amazing! Your blog contest is nuts! I’ll try to blog about it on my site and provide the link back. I already subscribed, dugg, and stumbled the contest. Subscribe (2) + Technorati Fav (1) + Stumble (1) + Party Contest Pic Posting (2) + Comment (1) = 7 Lucky Points!!! Should I be lucky enough to win, I’m particularly interested in Entrecard credits. I just made a post about this contest. I think I made them all correctly except for fave you becoz according to Technorati, I already reached the max. of 200. By the way, just to inform you that there are 2 blogs with dead link; Jason of University Kid and Borzack of Making Myself Extra Money. No matter how many times I click them, they’re still dead. Another thing, I think “Jonathan” is not the username of the owner of Archon Digital coz when I checked his About Me page, I did not see any name on it. I suppose you overlook it coz the name after him is Jonathon. Not sure though. But you have really an amazing contest. It’s worth joining. So, in total, I’ve 47 points! Thanks. hi, could you check if the badge is right? Hey great offer and prizes, i would love to participate! Hi great looking contest you have set up here. I have faved you on technocrati link below. Put a banner on my blog with a link to this page and subscribed to the email above I think this gives me 6 points. I would love to win some EC credits or better stil free advertising for my site. stumbled and left reply here. :) Sign me up! I am the 101th commenter and I also joined in yesterday. Just here to say that the link of Jason of University Kid is still dead, while Borzack of Making Myself Extra Money is now live. Let see if I can win something with just 1 point! Thanks for letting me be a part of this event! Good work! And good luck everyone! Now, that’s one way to make lemonade out of lemons! Great show Marcus. I’m sure this will be a lot of fun for everyone involved. this is one heck of a party! I am glad to be a part of it. I have posted about it, YEE HA! I will stumble (theladyrose) and digg (hopefully I’ll remember I think I can login) when I get home, can’t access those from work. Very very nice, just a great idea. I will monitor this party from outside. I wish all of you good luck, “Hoch lebe Hochstadt!”. Wow, this is impressive marketing. So are your Alexa stats! Followed the entry guidelines, Are You Coming To The Party , stumbled, dugg, technorati, and all that. Just waiting for the confirmation email. Love the pictures for this too! Good luck with the rest of your contest it is really cool. Great participation! I’m taking note because after 3 days of advertising a 25 dollar contest of my own for a quick story about folks favorite places I have zero participation. Ha Ha Ha… I’ll figure it out I have one idea that feels like a good one, but I have many days of content and converting to a cleaner html template. An amazing contest! I’ve subscribed and stumbled this page. Best of luck to all of the entrants!! This is a great party. I’ve never seen so much prizes at the same time. What a diabolical scheme to get links and trackbacks. We’re not worthy. We’re Not Worthy. Oh, heck, yes we are. I’ll take Gary Evans Manifest a Miracle, since that’s how I got here. This is one of the best contests I’ve seen so far. Hope it turns out really awesome for you! I would love a copy of Internet Business Guide For First Class Progress. and inserted the images linking back to your blog and this contest and i subscribed to you by email! I’m a subscriber and I like your style. 2.i comment wright now about it. don’t see my comment yet..hope something it’s not wrong..
i think i made it for some 40 entries in your huge contest. hope it gets me some beerstocks, wikipages, and a lot of EntreCard credits. I still think this rocks! My favs on digg, stumble and twitter are under whyzz whether or not the email address is the same. I use several. How about posts on several blogs? I have a coiupole more that I am certainly willing to use. Charlotte, sure, go ahead! When you post on more than one blog you’ll get more points. To everyone, some comments and trackbacks landed in the Akismet folder. So when your post doesn’t show up immediately, check back later. Rest assured I’ll take a look and pull your comment out from Akismet to the good folder. Wow – great stuff. I am always up for a good contest and have been meaning to subscribe to your blog anyway. Best of luck to everyone! Wow, that’s quite the contest. I subscribed to your feed and added the image linked to your site on my blog http://trcoach.com. Also Dugg and Stumbled by TRCoach. I subscribed to the announcement list (2), I wrote a post that linked back to your blog and to the party post (10). The post has links to all the contributors (30). I have the graphic on my sidebar (2) and it links to this post. With this comment, I believe I have 45 points. Awesome! Thumbed the post for good measure! At present am in mood to earn only 2 point thru this comments. Subscribed and commented. w00t. 3 points. I’ve subscribed to email, blogged about it and commented here. Good luck to all. may i know how to claim my entrecard credit? Thank you so much! Wonderful contest! 2000 EC helps my struggling blog a lot! I just found out that I won a prize. How do I get it? I’m not a lucky person and if I could win something, anything, I’d be a happy blogger! I wish I had seen this in time ;-) Now I’m waaaay too late.